We seek a postdoctoral researcher to develop mathematical and statistical models of viral processes, linking data across scales to understand the determinants of zoonotic emergence risk. This position is linked to an exciting DARPA-funded project that brings together a world-class team of researchers across disciplines from virology to ecology to epidemiology, to study emergence risks from bat-borne viruses including Nipah and Hendra virus. The primary focus of this position is to design quantitative methods to integrate virological data collected in the lab and in the field, at scales from molecules to animals, with the goal of developing biological insight and practical predictors of the evolutionary and epidemiological risk posed by potential zoonotic viruses. 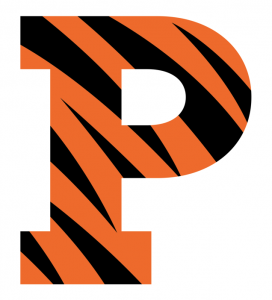 The position offers the rare opportunity to interact closely with top empirical researchers in virology and allied fields, and to participate in designing on-going data collection to support future rounds of modeling. There will also be rich opportunities to collaborate with other groups on modeling zoonotic spillover, transmission dynamics and viral evolutionary dynamics. To inquire, please contact Jamie Lloyd-Smith jlloydsmith@ucla.edu with your CV, a brief statement of interest in the project and relevant experience, and your potential start date. Review of applications is on-going until the position is filled. 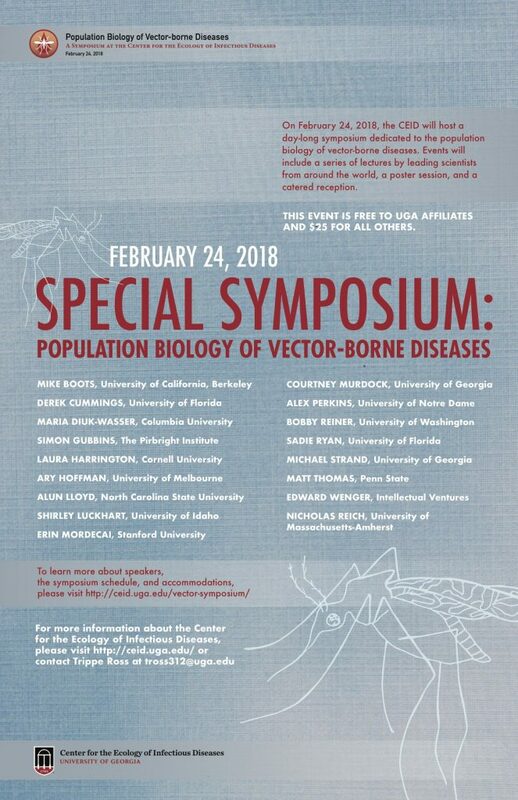 Symposium on Population Biology of Vector-borne Diseases at the Odum School of Ecology February 24, 2018. The Center for the Ecology of Infectious Diseases at the University of Georgia is pleased to announce that a scholarship has been established to support student travel to our symposium, Population Biology of Vector-borne Diseases, which will be held at the Odum School of Ecology on February 24, 2018. This event is a great opportunity for faculty and students to hear from leaders in the fields of biology, ecology, veterinary medicine, entomology, epidemiology, biostatistics, and geography, whose work focuses on the rapidly growing field of vector-borne diseases. Abstract: Complex systems paradigms, such as critical slowing down, regime shifts, systems theory, and computational forecasting, have taken center stage in the global effort to predict and mitigate emerging and re-emerging infectious diseases. Such approaches are predicated on models integrating information collected typically at microscopic scales and extrapolating macro-scale phenomena, such as bifurcation, percolation, and persistence. Complex systems perspectives and methodologies are essential as we come to grips with the ecology, immunology, and evolution of complicated infectious disease systems. Pertussis offers a prime example of this in the context of a scientific problem of great timeliness and importance. The current re-emergence of pertussis, once seemingly on track to eradication, is enigmatic, due largely to its complexity as a host/pathogen system. In particular, the dynamics of pertussis are shaped by the interplay of pathogen transmission, host immunity, host contact-network structure, pathogen evolution, and public-health intervention across a wide range of spatio-temporal scales and levels of biological organization. Globally, trends and cycles in pertussis prevalence are idiosyncratic, due to variations in human behavior, geographic transmission bottlenecks, and dynamic variation in the nature and extent of public health intervention. The resulting scientific contention can only be resolved by theory capable of reconciling disparate, and seemingly contradictory, observations. Key elements of such a theory necessarily include: heterogeneities in immunity, age- and spatially-structured contact networks, dynamism in contact-network structure at behavioral time-scales, and large exogenous perturbations due to vaccination campaigns and behavior changes. Simplified versions of such theoretical systems display (1) prolonged transient dynamics which can contain signatures of the mode and efficacy of immunological protection, (2) sensitivity to contact-network structure, (3) prominent interactions between nonlinear and stochastic effects, and (4) manifold potential for counterintuitive emergent effects resulting from the above. The intellectual aim of the workshop will be to develop a complex-systems theory of pertussis within an inferential framework suitable for confronting models directly with extant data drawn from epidemiology, behavior, and immunology. This theory, and the techniques used to test it, will be readily generalizable to other disease systems because our efforts to resolve the causes and consequences of pertussis’ resurgence will necessarily be focused on the essential theoretical questions at issue in complex eco-epidemiological systems generally.